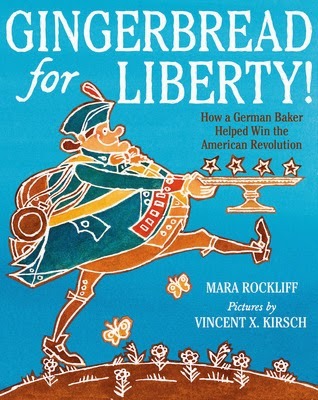 The Nonfiction Detectives: Gingerbread for Liberty! Today is Patriots' Day in honor of the first battle of the American Revolution, so it seems like the perfect time to feature Gingerbread for Liberty. Mara Rockliff introduces young readers to Christopher Ludwick, a baker and little-known figure from the Revolutionary War. Ludwick's job was to make sure the soldiers were well-fed. He served as the baker for the Continental Army, and he also baked for prisoners of war (many were from his home country of Germany). Kirsch's whimsical, watercolor illustrations look like gingerbread with masking fluid outlines that resemble icing. The narrative style with many exclamatory sentences make Gingerbread for Liberty an engaging story for kids and an exciting book to read aloud. 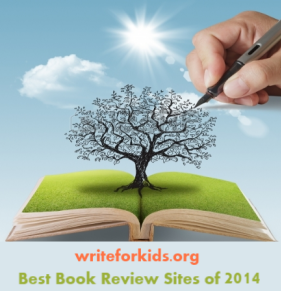 The story could also serve as a springboard for readers who want to learn more about the American Revolution. Although, the use of dialogue without source notes shifts the story from nonfiction to historical fiction. Be sure to read the author's note to learn more specific information about Ludwick's work as a baker and his humanitarian efforts in Philadelphia. Readers who enjoy baking may be inspired to test the gingerbread recipe printed on the endpapers. Visit Vincent X. Kirsch's website to see illustrations from the book. I loved this book! It was so well done & fun to read, and those gingerbread illustrations were just a perfect accompaniment to the text! Thanks for featuring it here.